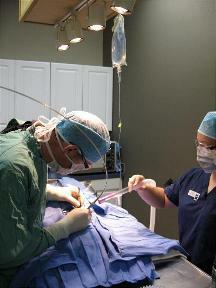 Though routine, spay (ovariohysterectomy) and neuter (orchiectomy) are major surgeries for your pet. Therefore, these procedures are taken seriously by the staff and doctors at our practice. We analyze blood chemistry for every pet prior to surgery and develop an anesthesia plan customized for your pet. Because pain relief is important to us, all surgeries are performed with the CO2 laser and all pets receive injectable and oral pain relief. Our policy is to provide the same level of care to your pet as we would provide to our own animals.